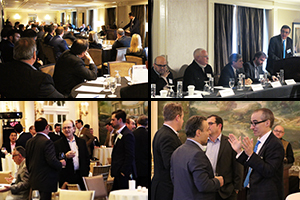 NEW YORK, NEW YORK – December 19, 2018 – GameChange Solar today announced that the Capital Intro™ Summit was a great success with attendance from leaders in finance, development, and EPCs engaging with technical experts with cumulatively over 1,632 years in renewable energy. The Summit panelists made candid, thought-provoking, and inciteful comments on various topics ranging from cost-reducing strategies. key growth market opportunities, and an analysis of bifacial modules. Derick Botha, Sr VP of Business Development at GameChange Solar, stated: “We are excited to have hosted this annual event in NYC, the finance capital of the USA. Several of the panel topics and questions resulted in robust discussions on bifacial modules, the future energy mix and reducing costs for project viability. The event then led into an evening mixer for all the attendees to network and possibly lead to greater opportunities in solar development, thus furthering the GameChange Solar mission to repower the planet."